We stereotypically think of Spaniards as the hot-blooded types and Canadians as being rather unassuming and vanilla, but fishing is important to both nations. That might not sound like much of a shared bond, but it allows Pedro Almodóvar to transpose Alice Munro’s three interconnected short stories “Chance,” “Soon,” and “Silence” from Canada to Spain. In the process, he gives the Sirkian stories a Hitchcockian tinge, not unlike his 2011 film The Skin I Live In, in which the story collection Runaway briefly appears, Easter Egg-like. 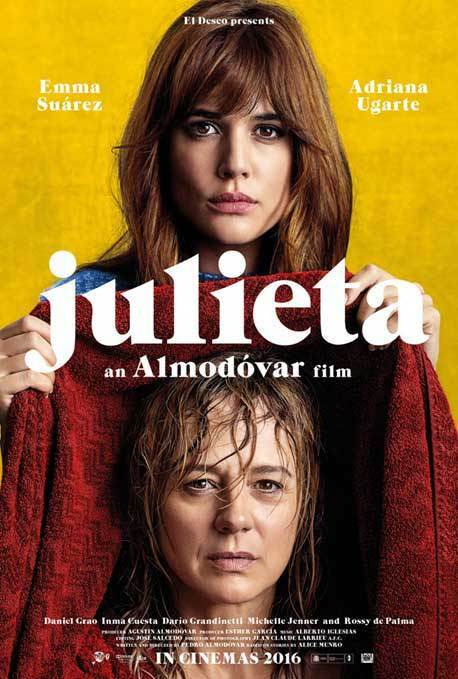 Not merely poised the verge of a nervous breakdown, the title character will often teeter over the brink in Almodóvar’s Julieta (trailer here), which screens during the 54th New York Film Festival. Julieta Arcos’s flashbacks will start when she chances across a friend of her long lost grown daughter Antía, who off-handedly mentions running into the missing woman on the streets of Madrid. Just when Arcos had agreed to leave town with her eternally patient gentleman friend, she finds reason to stay and carry on her fruitless search. With the help of a little wine, Arcos drifts back to when she first met Antía’s father Xoan as a fellow passenger on a romantic but somewhat tragic sleeper train. Obviously, there were sparks, but Xoan’s comatose first wife made long-term commitment rather awkward. Nonetheless, Arcos will eventually seek out the commercial fisherman, fatefully arriving a day after the inconvenient spouse’s funeral. The heat is still there, but Julieta will also meet Ava, Xoan’s platonic best friend, except possibly with benefits. Lingering questions regarding their relationship will lead to tragedy, which in turn contributes to Antía’s extreme decision to sever all ties to her mother. Although not a thriller per se, Almodóvar deliberately emphasizes all the mysterious elements, like the deliberately missing person, an unfortunate death on the tracks, and all the romantically noir elements of strangers meeting on a train. Even Adriana Ugarte hairstyle as the young commuting Juliet looks inspired by Melanie Griffith in Body Double. Clearly composer Alberto Iglesias got the memo, because he definitely tries to channel Bernard Hermann. Frankly, the richness and sure-handedness of Almodóvar’s visual style is just of pleasure to behold. He and cinematographer Jean-Claude Larrieu give the film a vibrant color-noir look, in the tradition of Marnie. Yet, the grounded credibility of the linked narrative makes the third story alienation quite disturbing. As the younger Julieta, Ugarte rocks her 1980s dew and generally dominates the screen with a dangerous mix of seductiveness and naivety. As the older Arcos, Emma Suárez is vividly and viscerally guilt-ridden and neurotic, but also rather stately and distinguished. Yet, both will implode quite spectacularly, as befits Almodóvarian heroines. Despite its “women’s fiction” source material, Julieta is definitely more closely akin to Almodóvar’s Skin and Broken Embraces. Yet of the three said films, this is arguably the most accomplished. Darkly glossy, Julieta should well satisfy Almodóvar’s admirers and serve as an effective introductive to his themes and motifs for new viewers. Highly recommended, Julieta screens again tomorrow night (10/16) during the 2016 NYFF, with a return trip already booked for late December.